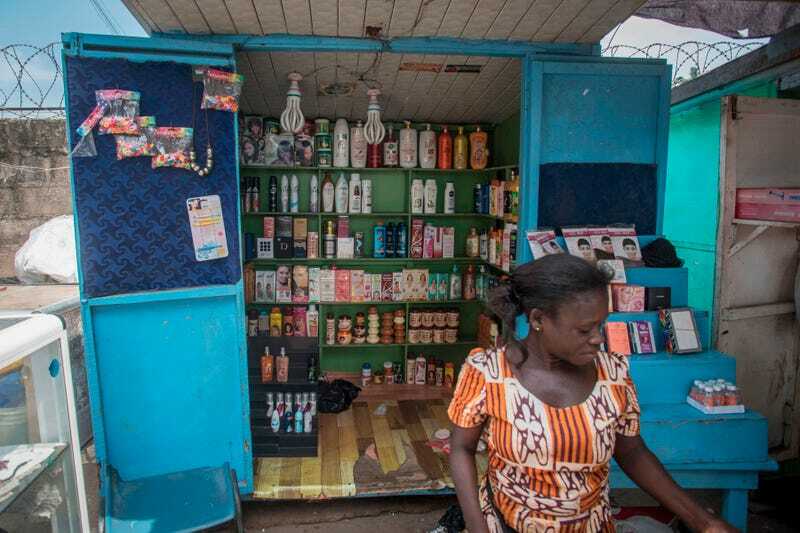 A shop sells skin-lightening products in Accra on July 3, 2018. Africa is experiencing a massive trend of skin bleaching, also called lightening or whitening, particularly in teenagers and young adults. The widening phenomenon is laden with health risks. In 2016, Government of Ghana banned hydroquinone, the main chemical component used in numerous skin-bleaching products, however, lots of different beauty brands are still promoting a lighter tone or a clarifying effect after its use. Rwanda just became the latest country to take aggressive action against the widespread practice of skin bleaching, now enforcing a ban on products that contain ingredients intended to lighten the skin—most commonly, hydroquinone. In December, Rwandan police told national outlet The New Times the move, in which officials are patrolling markets and seizing bleaching products throughout the country, had so far resulted in the confiscation of more than 5,000 banned products. The increased enforcement follows a November Twitter exchange between Rwanda’s president Paul Kagame and a concerned citizen. Calling on the Ministry of Health and Rwandan parliament, Kamage called attention to an issue that has long been plaguing Africa, as well as much of Asia. As CNN reports, a 2011 report by the World Health Organization indicated that approximately 25 percent of women in Mali, 77 percent of women in Nigeria, and 59 percent in Togo regularly use products intended to lighten their skin. The main adverse effect of the inorganic mercury contained in skin lightening soaps and creams is kidney damage. Mercury in skin lightening products may also cause skin rashes, skin discoloration and scarring, as well as a reduction in the skin’s resistance to bacterial and fungal infections. Other effects include anxiety, depression or psychosis and peripheral neuropathy. And yet, despite reports of the dangers of these products—which are manufactured throughout the world, including the United States, CNN cites findings by Global Industry Analysts that project the skin lightening industry reaching $31.2 billion by 2024. Frighteningly, this a more than 40 percent leap from $17.9 billion in 2017. Asia, the Middle East, and Africa are expected to be the locus of much of this activity.